This classic colonial home, all on one level, enjoys the ultimate San Miguel location and setting. On the picturesque intersection of the cobbled streets of Aldama and Terraplén, this home offers the ultimate to guests who really want to “live” the dream of this 17th century colonial hill town. Only two blocks to the Jardín and one block from Parque Juarez, this home is surrounded by art galleries, boutiques and restaurants. 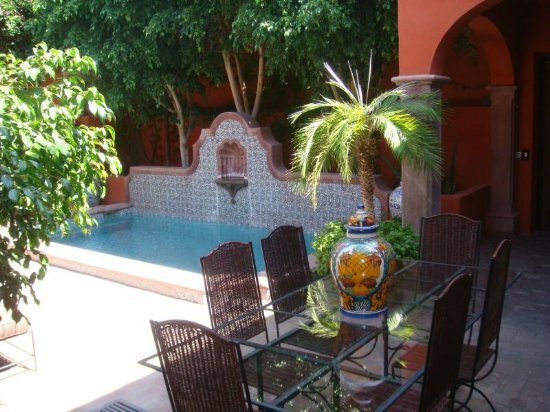 The owners of this property are a respected architect/design team and have done some of the finest homes in San Miguel. Entering this home you come into an open courtyard surrounded by a covered walkway or “portales” on three sides and a pool. To one side is a covered outdoor sitting area with a fireplace. There is also outdoor dining for 8 with an adjustable cover for shade to enjoy “comidas” by the pool, and lounge chairs to enjoy the sun by the pool. 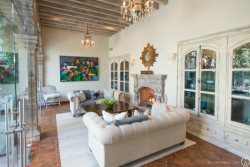 The great room with 17 ft beamed ceilings offers a living room which is warm and welcoming with lots of comfortable seating and a large fireplace; a dining room which seats 12 people; and a library which has a partner’s desk and a seating area for watching television. All the bedrooms are on the main level and reached through the “portales.” Each bedroom has an ensuite bathroom. The master bedroom has a king bed; and one guest bedroom has a queen and the other two twin beds. There is a powder room/pool bath off the outdoor sala. The eat-in kitchen is well equipped. The staff has been trained to perform all the household duties necessary to insure your comfort.